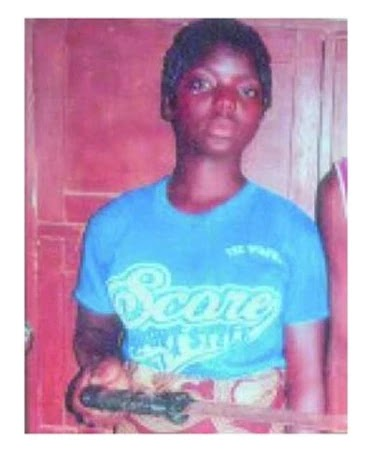 A 16-year-old girl has been arrested for the brutal murder of her father for stopping her from getting married to her 24-year-old boyfriend, Nasiru Musa who is already married. According to the reports, the suspect identified as Emani Kure was arrested by officers of the Abuja Police Command, for allegedly hacking her 40-year-old father, Kusha Kure, to death at their home in Karavan on March 11, 2018. She carried out the dastardly act because the deceased had not been in support of her marital plans with her 24-year-old boyfriend, Nasiru Musa. During her interrogation by the police, Emani said: “I killed my father because he did not allow me to marry my boyfriend. "My father has beaten me several times, to stop me from marrying Nasiru. Around 3.00am on March 11, my mother told me while we were sleeping outside, to go into my father’s room where he was sleeping. "She said that I should take his cutlass and kill him. I ran to where my father always keeps his cutlass and went to his room. I cut him on the neck with the cutlass while my mother held his leg. The 35-year-old wife of the deceased identified simply as Asabe, however, denied any involvement in the shocking act. She said, ''I went to the Bwari Police Division to report that my husband was killed in his room. "I told the police that I suspected my daughter and her boyfriend. Later the police arrested Nasiru and my daughter. "She confessed to the crime but claimed that I gave her instruction to kill my husband. I was not involved in killing my husband."